The Sandhills System is where all of our hosted services come together to ensure that your business operates seamlessly, increasing efficiency, organization, and accountability in your day-to-day operations. In addition to effective, on-target advertising through carefully distributed, audience-specific print publications and websites, the Sandhills System offers industry-focused services and technologies that help dealers organize and expand their businesses. From hosted services that include email, websites, customer and inventory management software, and accounting services, to big-picture enterprise resource planning tools that streamline workflow and generate results, the Sandhills System offers dealers a fully integrated and customizable dealer management system. The Sandhills System is where all of our hosted services come together to ensure that your business operates seamlessly, increasing efficiency, organization, and accountability in your day-to-day operations. A full-service workflow management solution, the Sandhills System streamlines your daily operations with versatile and customizable processes that connect different aspects, departments, systems, and individuals within your company. 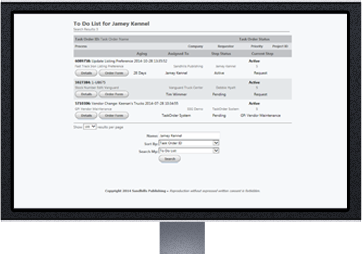 Create, assign, and manage electronic task orders through an internal, fully integrated, and mobile system. Existing processes can be easily implemented and customized to accommodate the individual needs of your business. Processes can also be built from the ground up with the help of your Sandhills sales rep and our in-house team of software developers and system specialists. Integrates all parties involved in the process of taking in a new trade and appraising its value from the salesperson out in the field to sales manager approval, and from parts and service departments to marketing managers. Allows salespersons to perform equipment inspections based on customizable parameters and on a mobile basis. One point of entry streamlines the process in adding newly inspected equipment into the inventory software system and getting it in front of buyers. A useful tool for salespersons tracking their daily sales activities, and for managers overseeing sales teams. Used to quickly and easily view, edit, and activate inventory items synced from the mobile inspection app. A human resources task order allowing users to request, approve, and track internal requests for vacation days and time off. Existing workflow processes are constantly growing and can be customized to meet the needs of your business. New processes can also be built from the ground up. As regular advertisers in Sandhills trade publications, dealers automatically gain access to our customized, Web-based dealer software, Dealer Services CRM. Using Microsoft Dynamics CRM (Customer Relationship Management)—Microsoft's premier contact management system—as a platform, Sandhills has customized and tailored the software to accommodate dealers in the unique industries they serve. Manage customers and inventory simultaneously with a customizable, user-friendly interface designed to increase efficiencies and organize your business. Schedule, track, manage, and integrate sales activities among sales reps and managers. This tool helps you organize company-wide interactions with customers, in addition to providing the tools and resources you need to better service your customers. Produce professional quotes on equipment and services instantly and efficiently with our Quick Quotes feature. Quotes are also traceable, so each quote can be easily tracked back to the related equipment, salesperson, or customer. Track and manage equipment sold and after sale information with convenient tools for tracking both active and inactive inventory. Create graphs, charts, tables, or lists to display any data tracked within the DSCRM program including leads, calls, quotes, inventory, sales, and more, and then use Dashboards to display them in a simple, easy-to-read, and completely customizable desktop. As both an organizational tool and a management tool, Dashboards is especially useful for comparing data and overseeing sales teams and initiatives. Track your entire rental fleet right alongside your customers and other inventory. Track rentals through every step of the process, managing rental schedules, invoices, and marginal costs on any given piece of equipment. Better manage new customers as they transition from sales leads to longtime buyers. The DSCRM system also automatically manages leads coming in from online advertisements and postings from users looking to purchase specific equipment or services. Want To Buy solicitations for particular equipment or services are posted online and automatically populated into a dealer's software database when the listing corresponds with a piece of inventory in their fleet. The service provides dealers with ongoing leads for customers who are ready to buy specific items from their inventory. Organize and display contacts to better target specific buyers or groups of buyers. Group contacts into lists and information into customizable views based on specific filter criteria to better organize and access the information you need. Market Trend Analysis is an invaluable research tool for determining market values, pricing used equipment, and spotting trends in retail and wholesale markets. The tool allows dealers to search a comprehensive and secure database of after sale data on assets sold by dealers around the country. Dealers can edit their own print ads directly online using the Edit Via Web feature. As long as an Internet connection is available, dealers can update photos and change information at any time. Sandhills sales representatives can also make changes at the dealer's request. Featured listings appear first in user search results on any Sandhills website, attracting more buyers to your equipment postings. Record and manage costs and expenses—such as those involved in shipping, inspection, maintenance, rentals, and more—related to a specific piece of inventory. Dealers can track costs using a number of parameters including date, assigned invoice number, inventory, or even the contracted repair or maintenance company. Call Statistics lets dealers assign a phone number to print or online listings in order to track the leads/ phone calls coming from particular ads. An advanced tool for improving advertising and business models, Call Statistics can be used to show dealers their return on any advertising medium they're investing in. Receive alerts when specific pieces of inventory have been on the lot for a specified amount of time to better manage and move inventory. Export reports, inventory, customer information, and more from the DSCRM software into a variety of useful formats including PDFs, XML files, and Microsoft Excel spreadsheets. A dynamic search tool, Advanced Find helps you quickly and easily sift through the wealth of information stored within DSCRM to access information related to customers, inventory, quotes, rentals, maintenance work, sales activities, and more. A powerful research tool for buying and selling used equipment, the Historical Equipment Search gives dealers instant access to any and all information on any piece of equipment listed and sold through any Sandhills publication in the past. Build customized reports specific to the needs of your business to better manage inventory, sales personnel, daily business functions, accounting procedures, and more. Sandhills' hosted email services provide businesses with the convenient, secure, and manageable communication tools they need. Fifty-two gigabytes of allotted storage provide users the memory and space they need without limitations, while constantly evolving security measures (including Iron Port and spam filters) ensure that messages and information remain secure. Sandhills' hosted email services also integrate calendar activities, customer interactions, and tasks from our customer and inventory management software so dealers and sales reps never miss a beat. If you ever need additional technical support or assistance, our in-house IT support specialists are available at no additional charge. Dealers work directly with sales reps and IT professionals to build websites that meet their needs and the needs of their customers. Websites hosted with Sandhills are completely customizable, and making changes and updates is simple and easy using Sandhills' user-friendly content management interface. Best of all, inventory advertised on a dealer's website is linked to Dealer Services and Sandhills' websites, so that inventory updates sync automatically and data only needs to be entered once. In addition to building and hosting custom websites, Sandhills also offers ongoing support to help our customers effectively reach buyers and end-users including analytics resources, domain name management, and SEO (Search Engine Optimization) strategies. Website language translation assistance is also available to dealers looking to reach international markets. For dealers with custom hosted websites, Sandhills Publishing offers complimentary user-friendly, mobile-focused websites for on-the-go access. These mobile sites are completely customizable to meet the needs of dealers and their customers. Duplicate data entry is an inefficient and unnecessary use of your sales team's valuable time. In addition to integrated internal software efficiencies that better organize and automatically update customer and inventory data, Sandhills offers seamless integration services that synchronize manufacturer data with any business system. From online auctions and data feeds to websites and inventory, Sandhills' data integration technologies improve your day-to-day efficiencies and your ability to effectively service customers and move inventory. An accounting software solution customized and integrated into the user-friendly Dealer Services software interface, Microsoft Dynamics GP allows dealers to simplify their day-to-day accounting operations. The software also gives dealers the ability to streamline the entry and processing of sales and purchasing transactions with fully integrated, custom workflow processes that connect departments and people within a fully integrated business system. Managing finances, inventory, project accounting, human resources, and customer relationships is easier and more convenient than ever before. The Sandhills System integrates different departments and areas within a dealership and can work with your existing systems or replace them altogether. Security rights for each user within the system are completely customizable, and each process is cataloged and accessible to improve both efficiency and accountability within your business. When your business and the technology behind it are secure, up-to-date, and running smoothly, you're better able to service your customers. With Sandhills' cutting-edge software solutions, and the continuous resources you need to implement and utilize them, your focus remains on your customers and your business—let us worry about the logistics. As technologies at Sandhills evolve, so too do our security protocols and preventative measures which ensure that data and information remain protected. Advanced security protocols—from data encryption and the use of virtual private networks to data redundancy and third-party verified interface solutions—ensure that digital security is an evolving and ongoing priority. Of course, in-house IT support specialists are also available to assist dealers with security questions or concerns on an ongoing and complimentary basis. Sandhills' continuous investment in its data servers and the technologies that improve their security, efficiency, and storage capacity translates into fast, secure, and reliable service for both dealers and end-users. Established in 2000, Sandhills' Redundant Data Center in Scottsdale, Ariz. functions as a data redundancy center in addition to running some of Sandhills' hosted services live. The redundant server farm ensures that a system failure at either branch will not cause an outage for users, as Web traffic will reroute to the other system in a secure fashion. The hardware required for setting up or upgrading your business system can cost tens of thousands of dollars, not including additional storage, network setup, upkeep, and maintenance. Purchasing an on-premise business system also means paying more for software licensing. With Sandhills, advertisers receive one free monthly subscription account to utilize the software. Additional subscriptions (which are billed to our customers at cost) are a month-to-month commitment, so users can be added or removed as needed. Oftentimes upgrades and changes are required as your business grows. Sandhills software solutions are designed and customized with growth in mind. As your company grows, Sandhills will continue to evolve to meet the changing needs of your business. Whether you're learning or implementing a new Dealer Services program feature, or attempting to rectify a malware infection, the Sandhills Publishing tech support team is here to help. An in-house team of qualified tech support specialists is available to assist with any and all computer-related issues at all times. Customers can call for support with any hosted services Sandhills provides. Copyright © Sandhills Publishing Company 2019. All Rights Reserved.